Implantology is a quickly developing branch of stomatology. Never before has implantological treatment been so predictable and simple to use when treating various dental defects. Implantological therapy involves the insertion of titan screw into the patient’s bone, the screw reproducing the lost tooth root. Using implants we can compensate single and multiple dental losses including whole dental arches. Crowns and bridges can be mounted upon implants, which are permanently fixed within the oral cavity and perfectly mimic natural dentition. Due to implants we can stabilize movable prosthetic restoration returning the comfort of biting and speaking to our patients. Because of to the latest achievements in dental technology, it is feasible to mount upon implants crowns or a bridge directly after implantation. Usually however, implant treatment requires a stage-wise procedure in order to prepare the bone and the gums for implantation. It could be a bother, though the modern progress in implantology shortens the time between diagnosis and the moment of leaving the dentist’s surgery with a new beautiful smile. 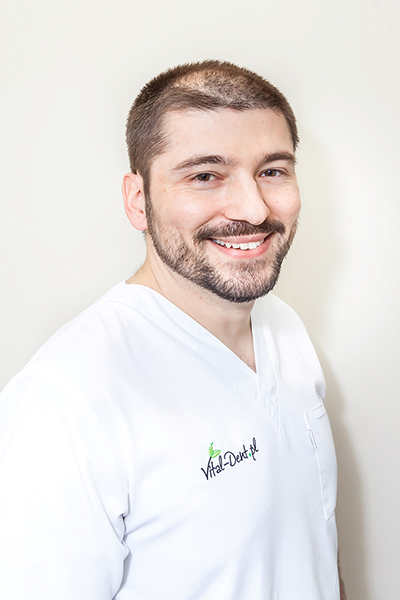 The Vital-Dent.pl team continually better their qualifications attending courses and symposiums, as well as employing the experience of our long-term implantology consultant. To achieve the best possible therapeutic result, each implant patient is consulted by several specialists, and detailed diagnostic tests are carried out. Each implantology patient undergoes tomographic examination.